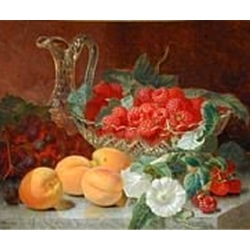 Raspberries in a Glass Dish with Peaches, Grapes and Convolvulus on a Marble Ledge, Stannard, Eloise Harriet (1829 - 1915) British painter. The daughter of Alfred Stannard, Eloise was a member of one of the foremost families of artists which characterised the Norwich School. She may have attended her father's art classes, and assisted in his studio.